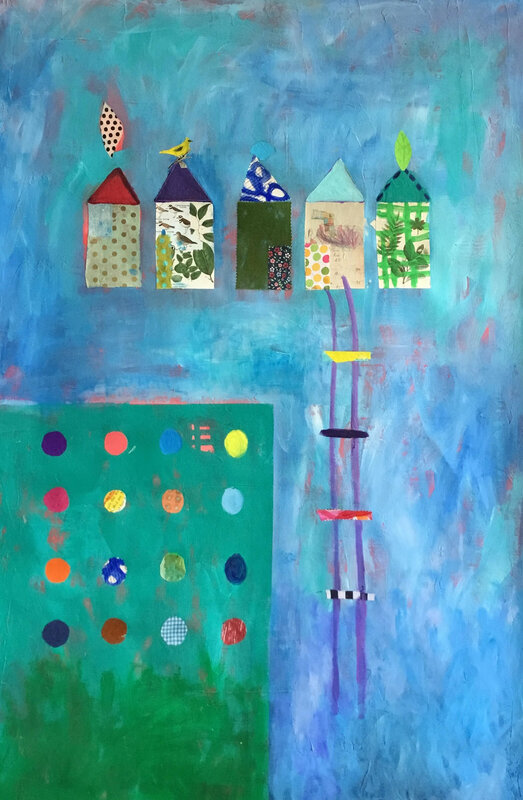 Beach Houses, Mixed media on canvas, 60" x 39"
Pam Smilow grew up surrounded by art. Her father was a modern furniture designer, sculptor and painter. She was raised in a unique cooperative community founded by Frank Lloyd Wright, where all the modern homes were integrated into their natural surroundings. New York City, with its myriad museums and cultural opportunities, was her backyard. From a very early age, she knew that she wanted to be an artist. Smilow's paintings are full of life, color and child-like primitivism. No surprise, since she draws on childhood experiences and memories for her vocabulary of symbols. These icons have remained consistent over the years: ladders, windows, vessels, flowers, houses, trees, clothing (based on paper doll cutouts). Her work grows out of abstract expressionism but has a variety of other influences. Nature continues to be her major inspiration. Pam Smilow’s work is part of many corporate and private collections throughout the United States and abroad.